Pre-meet practices are different for everyone. I’ve tried a lot of different things over the years, and many of them have been helpful or comparable to each other, but I’ll tell you the one thing that absolutely doesn’t work: Doing nothing. The only time I’ve really done this was in 2015, when Russ and I arrived from my brother’s wedding in Seattle (wouldn’t miss it for the world) the night before my Toronto Pan-American Games competition. After some treatment (that’s a long travel day), dinner and a too-long team meeting, I was about to do a very brief bodyweight circuit and core as a pre-meet in my room in the village at 9:30pm. Then I found out the competition time had been changed from around noon the next day to 10am. That’s 7am Seattle time, and I hadn’t packed for my morning, which I had been told would start with a silly-early shuttle to account for the hour bus ride to the stadium. So, I climbed in bed as quickly as possible without moving my body, and I felt absolutely awful the next day. There were a lot of factors involved in that feeling, sure, but I think I would have been very slightly more prepared if I’d spent ten minutes doing something physical, regardless of intensity! Last throwing session before this weekend's season opener! That looks like a lot, but it’s all very short and explosive once you get warmed up. You just want your body to fire and remember how to do that right before the big day! 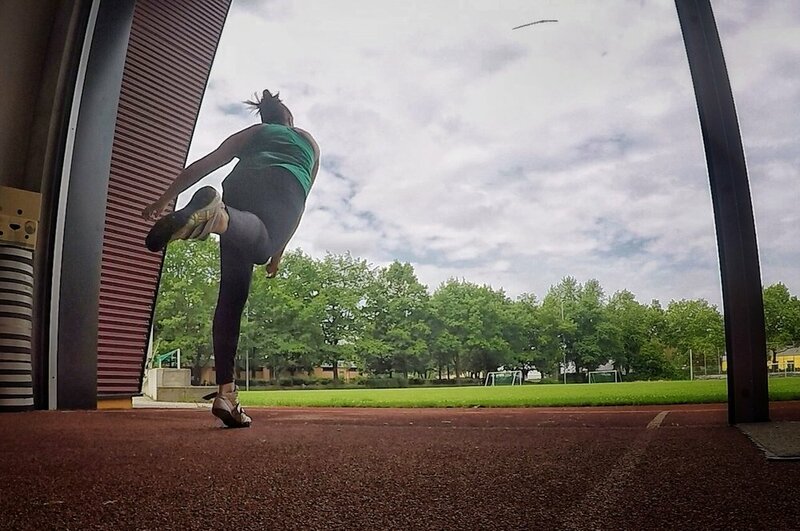 My training this year is different and new, my technique is slightly different and new, and therefore my pre-meet will be different and new! In reality, this kind of pre-meet has happened for me before and been really successful, so that’s part of the exciting plan in switching it up from past years. I tend to feel really good in competition at the beginning of the year, and I’ve always attributed that to too much tapering as the season really gets going. Yes, when competition ramps up, intensity in practice ramps down, but in the past I’ve been too careful during in-season training. I still need to be reminded of how it feels to be an athlete outside of throwing the javelin, and I’m so excited that Jamie and Dana and I are on the same page. Anyway, part of the issue with feeling undertrained during the season can be that there is less time for full lifts and practices because of travel and competition. I’ll have three meets during this Europe trip, which means that each week, I lose training days to competition, recovery days from competition, the second day before a competition that I take off (throw Saturday, off Thursday, for example), and, in the past, a pre-meet day. That’s four days per week that are basically devoted to meets and not training, leaving maybe one other throwing day, a lifting day, and a technical ball day plus sprints and jumps and other things to keep my body together. I’d rather take my pre-meet day back, make it a more normal training day, and go into a competition feeling like I normally do in practice, just extra excited! I lead a pretty darn active life. Yes, I train six days a week, but I also walk my dog about an hour a day, am renovating my mother-in-law’s house with my husband (manual labor galore), and we love to spend time outside either in the boat or hiking on the weekends. I like gardening and swimming and walking around the farm and cooking new recipes. I don’t stop moving usually. When I go to competitions, as much as I love being lazy, I’m trying to do slightly more than I’ve done in the past. I want to emulate the rest of life a little bit instead of feeling trapped in a holding pattern of rest that tricks me into nonchalance during competition sometimes. Maybe one approach, like in flats, without a javelin even. Full lift if possible (modify if not). I’m not an idiot. I won’t load all of my bars to the maximum and destroy myself the day before a competition, especially my first one of the year. But my pre-meet day will now be more like real life instead of hurry-up-and-wait time like in the past. Really excited about it! Sometimes weight rooms aren’t available, not even just in Europe, but in the U.S. too. When that happens, you have to either find your own (grab an Uber to the nearest public gym and pay), or make due with a hotel gym or even your own bodyweight. I did a suitcase workout late at night in Japan once. Two thumbs up. My first international victory! Here’s a general timeline for the 24 hours before a competition for me. I’m pretty relaxed about stuff in general, but tend to follow similar patterns, especially if I’m adjusted to the time zone I’m in! I’ll operate on this weekend’s schedule: Competition on Saturday at 2:30pm. Friday night: Bed. Have a treat before bed (usually chocolate). Tradition begun in college. Saturday 8amish: Breakfast and walk. Maybe core. Saturday 9-11:00 maybe: Relax. Perhaps nap. Shower now depending on when lunch is (I like to shower before competitions to wake myself up, especially if I’m competing overseas and I just got there). Saturday 12:30pm: Arrive at track, maybe check javelins in if that didn’t happen yesterday, relax for a bit.